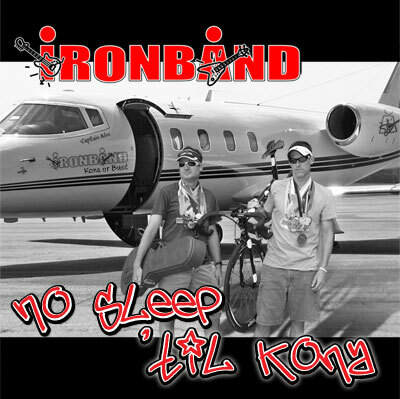 Ironband | Brand New Full-Length Album, “No Sleep ‘Til Kona” Hits Stores Today! Kansas City, MO, USA – June 9th, 2011 – The new full-length album from triathlete-musicians, Ironband, hits major digital music retailers today. Literally tens of people have been waiting patiently for the new album that brings us 15 new songs touching on themes new and old with titles such as “Tri She-Devil,” “Convoy,” “Age Group Body, Podium Heart,” “Shaved for ‘Nuthin” and more. Originally slated for an early spring release, “No Sleep ‘Til Kona” is just now hitting stores in light of the hectic schedules of work, family, pee-wee soccer, baseball, swim, and gymnastics, not to mention a full Ironman training schedule (singer Scott is scheduled to race at Ironman Lake Placid in July). The absence of Ironband guitarist, Mike, during recent studio sessions didn’t help with the production schedule either. The new album hits stores today and is ready to grace your digital playlists so head on over to iTunes, CDBaby, Amazon, or your favorite digital music outlet to pick up a copy before it sells out. Actually, I don’t think that a digital album can sell out, but pretend that it can, and then rush on out and pick yourself up a copy.